In an interview with Tatyana Alyoshkina of RBC, former Russian Finance Minister and head of VTB24 bank Mikhail Zadornov spoke about how the Central Bank has fared in its attempts to manage the current financial crisis, and shared his views on what awaits the economy in 2015. Since the beginning of the year, the price of oil has fallen below $50 a barrel, the ruble has continued to weaken, and on Jan. 26 the ratings agency Standard & Poor’s slashed Russia’s credit rating to “junk” status. Despite all of this, the chairman of VTB24 bank, former Finance Minister Mikhail Zadornov, believes that the crisis will not be as deep as that of 2008-2009, and that the weak ruble has a significant role to play in this. RBC: How do you assess the actions taken by the Central Bank in relation to the crisis? Which decisions were correct, and where were mistakes made? 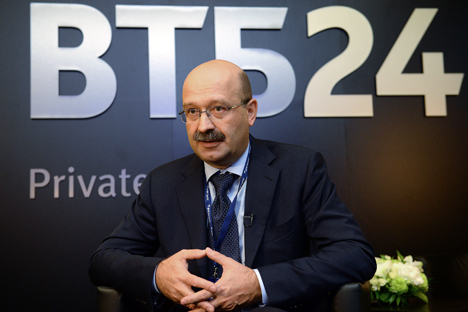 Mikhail Zadornov: It’s certainly difficult for the Central Bank right now. In my view, the Bank of Russia [the Central Bank – RIR] has been working harder than the government. Now we would like to see more coordinated work from them. The Central Bank cannot carry out anti-inflation and anti-crisis policies alone. Ideally, the government creates an anti-crisis committee, and the Central Bank takes an active part in its work. We would like to see the regulator showing greater consistency in its actions, swift reactions and more active communication with the market. The market simply didn’t understand some of the actions taken by the Central Bank, and this played a negative role. Judging by what is currently happening at the Bank of Russia, its management is aware of this problem. I’m talking about the appearance of new figures – Dmitry Tulin and Alexander Torshin, who are well-known to the market. RBC: Criticism is being directed at the Bank of Russia over the changes in the key interest rate, which proved unable to stabilize the ruble exchange rate and a host of other accumulated problems. Why didn’t raising the interest rate produce a result? After all, there are examples from other countries where a decision like that helped. M.Z. : I don’t consider that it didn’t work for us. Ultimately, raising the key interest rate, along with other government measures, helped to stabilize the situation on the currency markets. The reason the ruble has still not found a balanced position and remains oversold is clear. Unfortunately, the key factor affecting the ruble continues to be the price of oil. Since oil has not found its balanced price, the market is playing against the ruble. As soon as oil prices stabilize, it will raise not only the ruble rate, but also the price of all Russian shares – they will receive a fairer valuation. However, for the time being oil is continuing to fall. It makes no sense to compare Russia with any other countries. An appropriate comparison would be with other commodity exporters, which also depend on the price of a barrel. RBC: Well, for example, the leaders of the United Arab Emirates have stated that for them the fall in oil prices is not critical, since their economy is less dependent on oil prices. M.Z. : Yes, both their budget and external balance depend less on oil exports. In Russia, unfortunately, oil products and gas make up around 63 percent of all exports, while for the budget oil and gas revenues reach 10 percent of GDP; the rest – 8 percent. In the Emirates, tourism and construction make up a large share of budget revenue. But comparing us with the UAE is not really appropriate. The population there, if we count only those who are citizens of the country, is 1 million, and in neighboring Kuwait, 1.2 million. However, along with the population of Crimea we have 144 million. Therefore it would be better to place Russia alongside, for example, Brazil, whose population is around 190 million, or with Indonesia, where there are 300 million. These are also export countries with comparable levels of per capita income. RBC: Some experts, as well as the heads of large oil companies, are not ruling out a fall in the oil price to $20-30 a barrel. Could you give a short forecast for the economy if this happens: What will happen to the ruble, interest rates; what steps is the regulator likely to take in such a case? M.Z. : We don’t make such forecasts. Oil can fall to $20–30 a barrel just as easily as rise to $60. RBC: But you include macro forecasts in your business plan. What are they? M.Z. : We set out the following reference marker in our business plan: The average annual price of oil is $50 a barrel. Proceeding from this we reckon that the drop in GDP will be 4–4.5 percent. Nonetheless, inflation, which has risen to 13–14 percent in the first quarter, will begin to slow. From the second quarter onward, the Central Bank will have the opportunity to reduce interest rates. RBC: To what level could the Central Bank lower the interest rate? M.Z. : We think that the reduction will be gradual, and in the fourth quarter the Central Bank may lower the interest rate to 10.5 percent – that is, to the level it was at when the sharp rise was made in December. RBC: What do you think - will this crisis be deeper and longer than the one of 2008-2009? M.Z. : It won’t be deeper, because we anticipate that the decrease in GDP will be less than on the previous occasion, and because the Central Bank allowed the ruble to float. Not everybody recognizes the importance of this decision. The Central Bank concentrated the biggest shock from the fall in oil prices and sanctions on the exchange rate, and not on the financial and real sectors. If the ruble exchange rate had been kept within a [currency] corridor, then the reduction in production volumes would have been more significant. The Central Bank softened the effect of the fall in raw commodity prices on the Russian economy.